In my tennis-playing days, I was convinced that a new racquet would rescue my game. New shoes and shorts would help, too, but the guarantor of excellence was the latest racquet. Delusional, of course. I needed lessons, not new gear. Practice would have helped, too. I carried that same gear-to-the-rescue delusion into my long love affair with golf. Same outcome, of course. A top pro can shoot par with just a KMart five-iron. Without sustained effort, a duffer is always a duffer. I ran into a tech variant on this delusion yesterday. I was exploring a new email system (see blogpost “Life beyond Google”). Web site was persuasive, but then I ran into a chat tool that didn’t work, an online rep who didn’t know the product, and now a sales rep who hasn’t called. I am sure the technology in this product is terrific. But getting me from interest to sale takes more than promising technology. You’ve probably seen the same delusion in relationships. Changing partners is easier than nurturing the partnership you have. So is moving to a new neighborhood in search of better friends. Or changing jobs in hope of liking work more. Problem is: if you stay the same, the new whatever isn’t likely to be any better than the last whatever. If you don’t “take some lessons,” “practice” and grow your “skills” as a spouse, friend or colleague, the same old you produces the same old outcome. That’s why faith always involves transformation. New creation, new day, new you, new life. 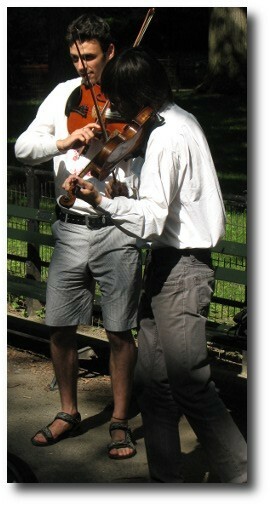 Photo: Folk musicians entertain tourists on the Mall in Central Park.